My friends, Mark Spina, June Fisher and I take an annual trip somewhere in the west each year. It gives me some time to spend with my God Daughter Jackie. This year we finally made the plans for an ALASKAN CRUISE!! It would take a lot of planning but would definitely be worth it. Resources I used included “A Birder’s Guide To Alaska” by George C. West, the article “Birding on an Alaskan Cruise” by Bruce Whittington in the April ‘09 issue of Winging It, Trip reports by Helen Baine’s from her ‘02 Alaskan Cruise (Helen’s Birding Page) and an excellent trip report by Richard Ferren from his July ‘97 Cruise. I found these resources invaluable in preparing for my trip and even many years after the trip reports, they were very accurate as to finding birds. Our group rented an Avis car in Middletown, New York ($601.00 total) and set out on a westward course the morning of June 30. We reached Beloit, Wisconsin, that first night. The next morning we crossed the mighty Mississippi River. As usual, I get to do a lot of birding on these trips and design them so that I can maximize the number of birds I can see. As we headed further west, western species began to appear. American White Pelican was the first, followed shortly thereafter by Yellow-headed Blackbird. That evening, we reached June’s brother’s home in Rapid City, South Dakota. Actually, Tom and Sandy Fisher live about 15 miles outside of the city in the Black Hills. They have a beautiful home and have welcomed us all on past trips. We can’t thank them enough for their hospitality. Their home and yard is set up to attract birds and the feeders and bird baths do a great job of doing so. The next morning I saw Townsend’s Solitaire, Western Tanager, Red Crossbill, Black-headed Grosbeak and many more right in the yard. After a big breakfast, we bid our fare wells and headed on. Wyoming and Montana are both beautiful. That night we made Missoula, Montana. En route, Western Meadowlark, Western Kingbird, Golden Eagle and Brewer’s Blackbird were seen to name a few. We were also seeing western wildlife like Mule Deer and Pronghorn Antelope. The next afternoon, we reached Bellevue, just a few miles outside Seattle, Washington. After we settled in we went to visit Mark’s uncle Phil. We had last seen him six years earlier on a trip to Seattle and Marrowstone Island. It was a nice visit and we enjoyed catching up. The next morning, July 4. We had plenty of time, so we toured Seattle Center. We visited the Space Needle, Science Fiction Museum, the flower garden and attended the Naturalization Ceremony being conducted in the park. We then headed down town to Wall Street, where we were to park the car for the next week. (One week cost for parking the car was $135.00) Everything went well, and we were soon on line to board our ship. We were taking a week-long cruise to Alaska aboard the Norwegian Pearl ($1,119.00 per person, including, taxes and travel insur.). Mark, June and Jackie were looking forward to all the fun on the ship, while I was looking forward to my biggest, longest pelagic trip ever! We set sail just about 4pm. Heading out the Strait of Juan De Fuca, I saw only a few birds, including the only Heerman’s Gulls of the trip. Also seen were many Glaucous-winged Gulls and a Pelagic Cormorant on a buoy. The morning of July 5 was one I was really looking forward to. I was up on deck early, having chosen my spot from which to do sea watches the day before. We were cruising the open Pacific Ocean about 25 miles west of Vancouver Island. This was a perfect location for pelagic birds! Rhinoceros Auklet, Northern Fulmar and Sooty Shearwaters were all seen. Soon, a couple of Common Murre showed and then a nice Black-footed Albatross. I always enjoy the Albatross and was hoping with the time and location I would get to see these birds. I was not disappointed. I was then pleased to see a Pink-footed Shearwater among the many Sooties. After eyeing dozens of Sooty Shearwaters all morning, I decided that either I couldn’t differentiate Short-tailed Shearwater or they just weren’t there. A short time later, as I watched two birds pass the boat just off the starboard side, I realized the first bird had a steep forehead. I quickly checked the bird directly behind it. It was a typical Sooty. I then watched closely to see if I could get a good look at the underwing. They both banked away from the ship and the dark wing lining of the Short-tailed Shearwater stood out from the light lining of the Sooty. I had my life SHORT-TAILED SHEARWATER! As we reached an area even farther from land, Leach’s Storm-petrels began to show in good numbers and I had another eight Black-footed Albatross. One Tufted Puffin sat on the water before flying along side the ship for some distance. So far, all of these birds were in Canadian waters. The morning of July 6 we had crossed into Alaska! I was now birding my 50th state and had my first Alaskan bird, a Pelagic Cormorant. 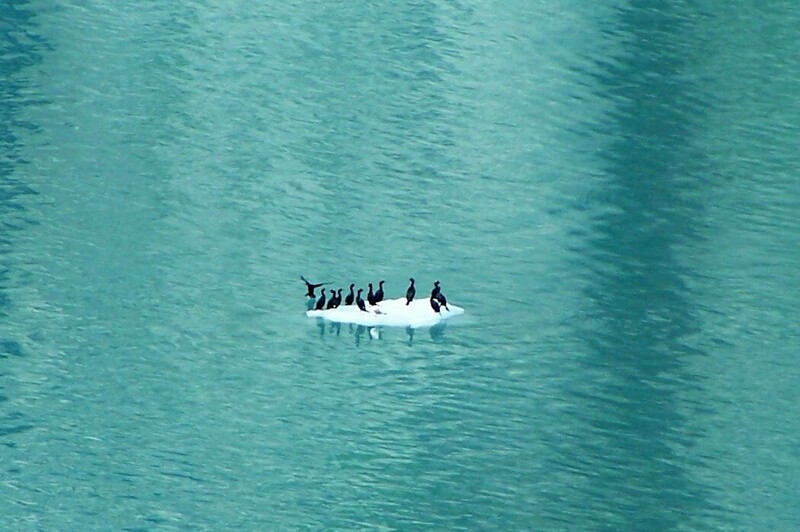 We entered Chatham Strait and birds decreased in numbers – in fact few were seen. Glaucous-winged and Mew Gulls and a few Marbled Murrelets were all I saw. We arrived in Juneau, Alaska, around 1:30 pm and were off the boat by 2 pm. We headed directly to the Mt. Roberts Tram terminal. Though I have an intense fear of heights, I was determined to reach the top for a chance at three of my target birds for the trip. My friends kept me talking and looking at things on the way up, but an occasional look down at the city far below gave me the jitters. We made the top, to find it fogged in. We went to the Visitor’s Center and shop and I asked about wildlife sightings. I informed the ranger of my intention to hike to Gold Ridge for birds, but my hopes were dashed when she called another ranger over and they informed me they would not let me go up. They said it had been fogged in all day and that the trails there are hard to follow without the fog, much less with it and it was too dangerous to attempt. After all my planning, this was a real upset. They suggested that I do the loop trail and the Robert’s Cross trail and leave it at that. We headed up the trails they suggested. A mist was falling, but fog had lifted well above us (but not above the Gold Ridge Trail). As we worked our way up, Varied Thrush could be heard singing in every patch of spruce. 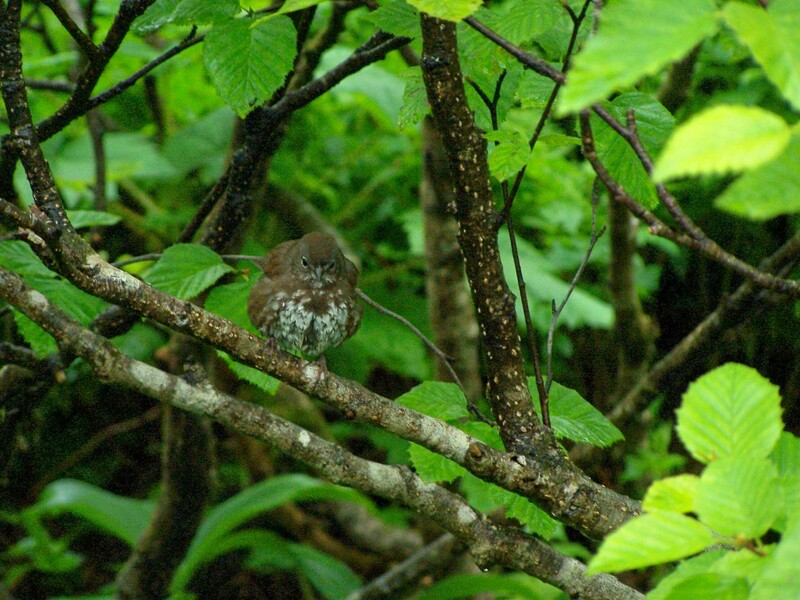 Sooty Fox Sparrows and Orange-crowned Warblers worked the thick Alders along the steep trails. A Wilson’s Warbler, which popped out along the way, was the only one of the trip. Hermit Thrush and Swainson’s Thrush could both be heard, too. As we went further, we saw a Sitka Black-tailed Deer feeding in an opening in the forest. Views of the Gastineau Channel below and the city of Juneau were fantastic. Once we reached Robert’s Cross, we could see the fog well up hill from us and the mist had stopped falling. I decided to hike up as high as I reasonably could. As I headed up one small ridge after another, the fogged thickened. I was not even to the top of the Robert’s Cross Trail and the fog was so thick I realized they had been right and there was no point in going on. I turned and headed back down. Two thirds of the way back down to the cross, I noticed a small trail to the left, which I scanned uphill. 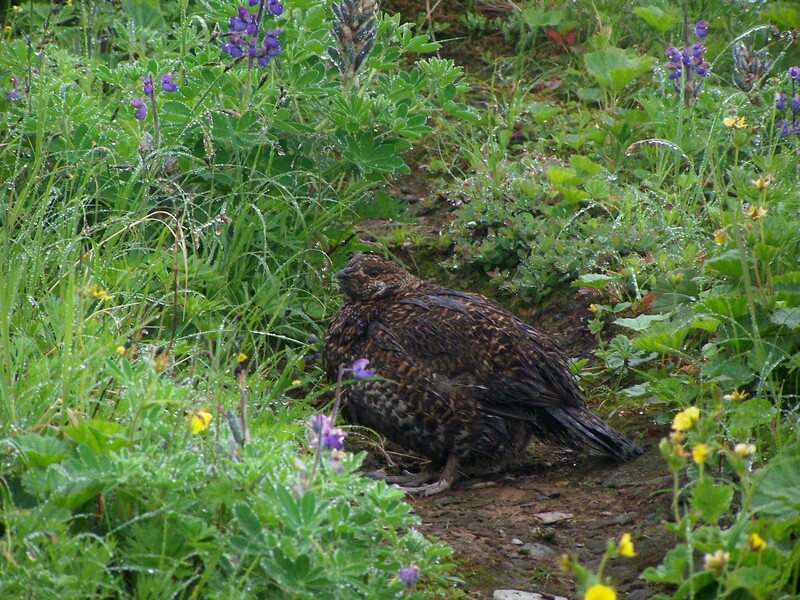 There, half way up the trail, was one of my target birds, SOOTY GROUSE!! My second lifer of the trip! After completing the trails and taking many photos of the fantastic views we pulled ourselves away from Mt. Roberts and headed into town. 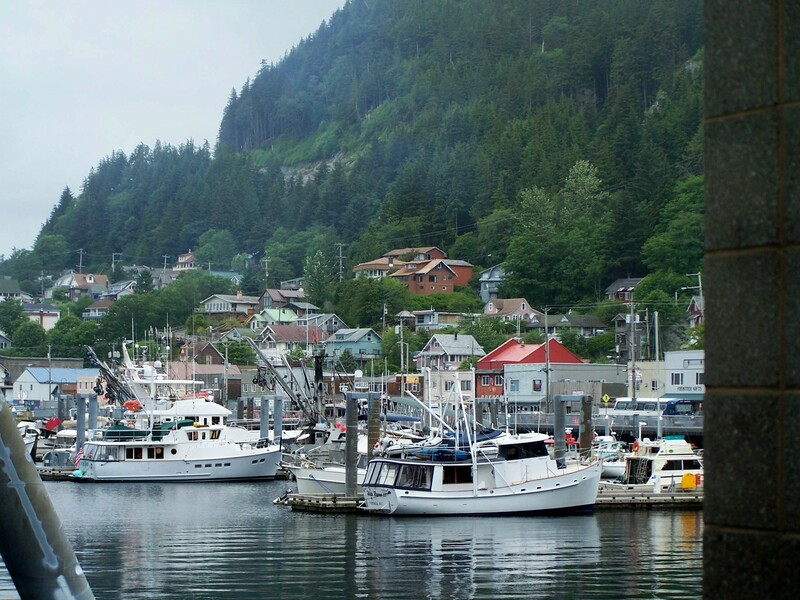 We checked out some tour possibilities and opted for a small bus tour covering several of the interesting areas of Juneau. Jerry (or Jer-bear as he referred to himself) gave an informative tour. We toured the city, seeing the State Capital and many points of interest, then headed out of town. 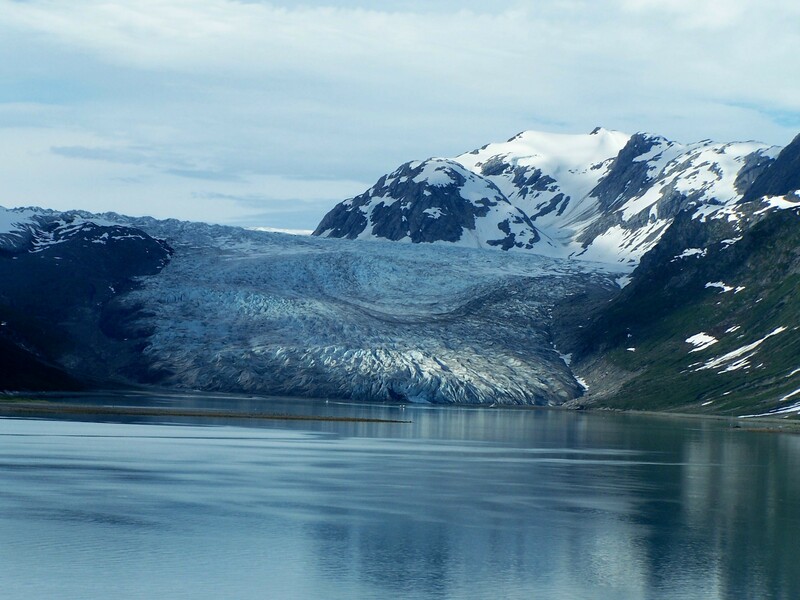 We visited Mendenhall Glacier, but not the area of the Visitor’s Center. The Glacier was impressive, but there were not as many birds in the area as I had expected. Many Glaucous-winged Gulls and the first half a dozen Arctic Terns of the trip were seen. From there we headed out of the city area along Auk Bay and then to the Shrine of St. Theresa. Birds of interest were Bonaparte’s Gulls, White-winged Scoter, Common Loon and Harlequin Duck. King Salmon that appeared to be about three feet long, were jumping out of the water regularly. We then headed back to Juneau for a little shopping before we boarded the ship. Another great meal with our free-style cruise was enjoyed by all. Having departed Juneau in the night, we awoke already docked in Skagway. Skagway is a beautiful city. This location had the most land birds on the trip. We toured the city and did some shopping. I birded as we went and made some excursions up side streets which were very productive. Stellar’s Jay, Chestnut-backed Chickadee, Townsend’s Warbler, Rufous Hummingbird and Oregon Junco were seen to name a few. 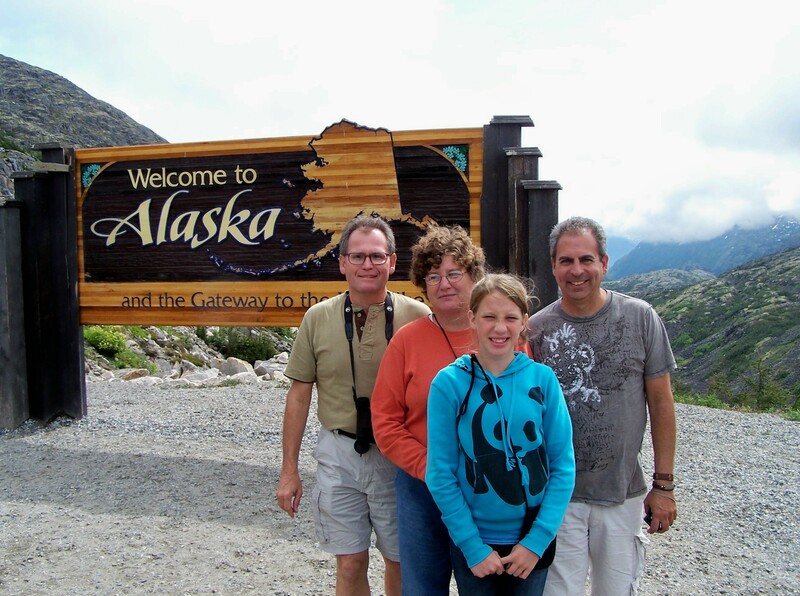 That afternoon, we took a tour of the city and then out the Klondike Highway to White Pass Summit. Our driver Joe told us many stories about the Gold Rush era and things that happened in and around the area. He also took us to some out-of-the-way places. The vistas were stunning. A Pacific Wren was the only new bird on the trip out, and we saw no Ptarmigans in the areas I had hoped to find them. Back in Skagway, we had many Arctic Terns on our walk to Yakutania Point. Sooty Fox Sparrows, Orange-crowned Warbler, Lincoln’s Sparrow and Song Sparrow were all seen. The only two Herring Gulls I found were seen here as well. Violet-green Swallows nested throughout town. We departed Skagway overnight and were ready to enter Glacier Bay National Park in the morning. What a fabulous place! 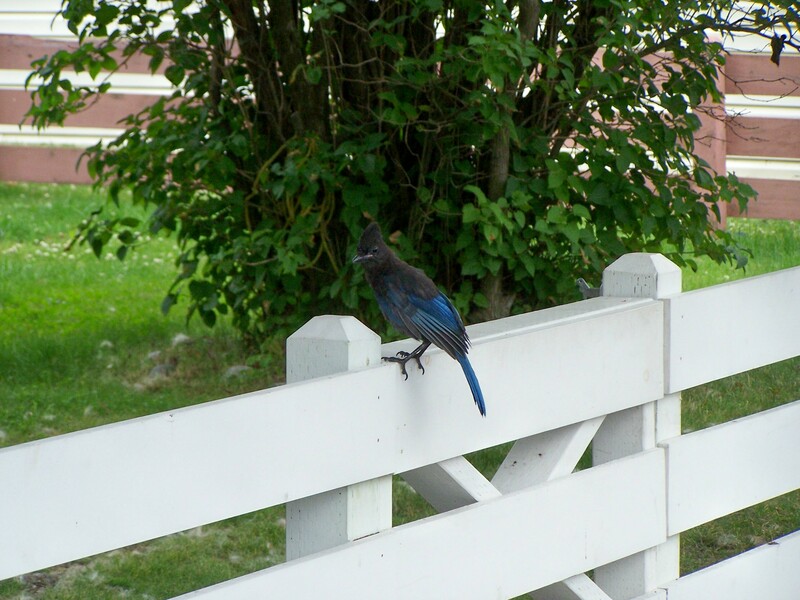 We began seeing interesting birds as we traveled through Icy Strait. Many species were abundant as we entered the bay. 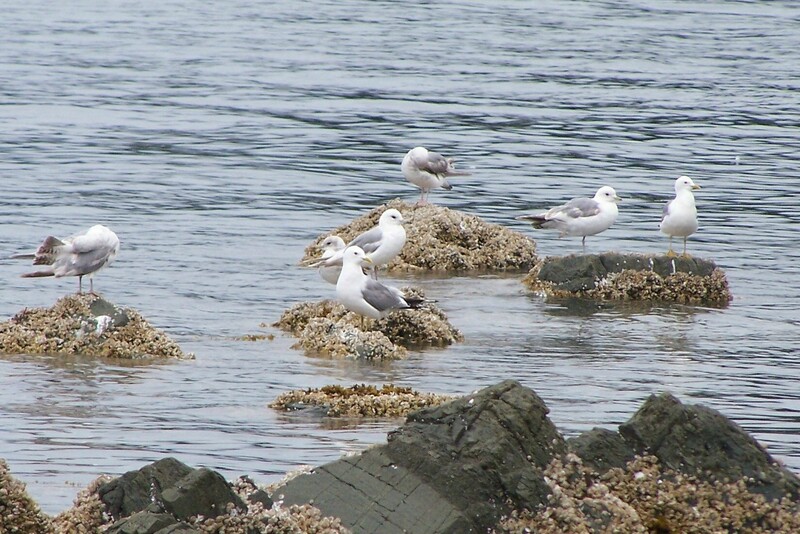 An underwater moraine near the mouth of the bay causes an up welling that attracts an abundance of birds. Black-legged Kittiwakes are everywhere to be seen. I had one good-sized flock of Red-necked Phalarope here. Marbled Murrelets were very common and I had a number of KITTLITZ MURRELETS, my third lifer of the trip. I had been concerned that they might be difficult to discern from the Marbled Murrelets. I had no problem with this. Excellent lighting and what I consider to be very distinct plumage made an easy ID. I can’t help but wonder, though, had I traveled later in the season when the young of both species had fledged and if the light had been poor (often the case due to rain and fog), I may have had more difficulty. As it was, the light outer tail feathers combined with paler coloring overall (marbled’s are very dark) made them stand out well. Sea Otters were very common. As we proceeded up the bay, a group of Tufted Puffins were feeding. As I looked through them, two birds surfaced at the edge of the flock, two HORNED PUFFINS!! My fourth lifer of the trip! This was probably the least common Alcid I had on the trip. I would see only three more Horned Puffins in the bay, and that was the only place I had them. Common Murres, Common Mergansers, Surf Scoters, Pigeon Guillemot and Pacific Loons were all common enough. As we headed back out of the bay, two and then three dark-phase Parasitic Jaegers flew around the ship. Many Humpbacked Whales were reported further down the bay, so the captain navigated close to the Marble Islands. 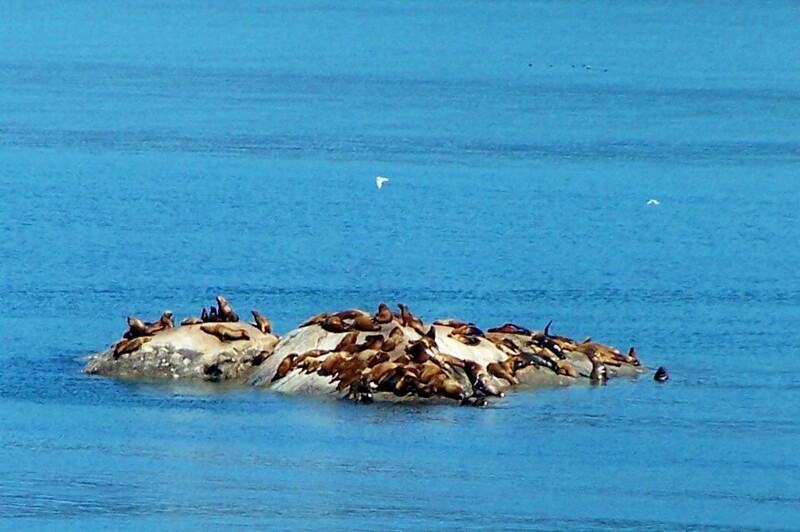 There are many sea birds and Stellar’s Sea Lions there, and we had great looks at both. It seemed the closer we got to the entrance of the bay the more Humpbacked Whales we saw. For the first time during any whale watches I’ve ever been on, the whales really were breaching fairly often. I even managed a picture of one half way out of the water! We were told by a number of the members of the crew that we just can’t imagine how lucky we were. They said that both the last two cruises had no sun and mostly rain and that our views were the best they had experienced yet this year. I knew it was great weather, but I hadn’t realized just how good. The views of the Glaciers were spectacular as well, and we enjoyed prolonged looks at the blue ice in the full sunshine. As it was now getting late, the sun was setting. It got to be twilight, but I’m not really sure how long twilight lasted, because the earliest I was able to rise in the morning was 4am and the sun was already well up at that time. We sailed into the night enjoying many of the entertaining shows they put on each evening. One was particularly good – a group imitating Frankie Vali and the Four Seasons. They were great. Mark, June and Jackie all enjoyed an array of activities on the ship. I was able to pull myself away from the deck a couple of times to go bowling and lose a couple of dollars in the casino. I also managed to run a couple of miles on the jogging deck a couple of mornings. You can’t tell a story about a cruise without mentioning the food. I never saw so much of it in my life. We had free-style-dining and the food was out of this world – anything you could imagine from all around the world. The morning of the 9 th found us in Ketchikan. We disembarked and did some more shopping while we waited for the wildlife tour we had signed up for. We caught our trolley, driven by our guide Marie. She was a pleasant, knowledgeable young women who made it a nice morning. She took us out to an area just past Mountain Point where Bald Eagles were abundant. She then took us to a Salmon Hatchery where the King Salmon were already returning to spawn. We were able to look over the side of the bridge and see dozens of salmon swimming up stream. As we looked out into a small bay, a Harbor Seal swam around just a short distance from us. We then went up a short side road where a Black Bear was checking out the creek for an easy fish dinner. He disappeared in short order only to return in a few minutes for everyone to see. On our way back to town, we stopped at Saxman Village. It is an interesting spot where many native totem poles are displayed. Marie told us many tales that the poles are supposed to depict. We went back to town for more shopping and sight seeing. We boarded the boat for our usual evening activities and another great dinner. On the morning of the 10th, we were well on our way south. The ship had turned out into the open Pacific once again where the sea birds abound! Changes had taken place in just one week. Last week I had only one Pink-footed Shearwater. This time I kept count until it reached about 70 birds, then I lost track. It was certainly near 100. The next species which had increased considerably was Black-footed Albatross. I had 18 of them in a short time- ten more than I had all together the previous week. In reality, I’m not sure if there was much of a change. The previous week we had gotten on deck early, but we were just passing Brooks Peninsula heading north. This time we were just passing Brooks Peninsula, heading south, so I had not birded this section of the Pacific on the earlier passing. At any rate, the birds were abundant! As I watched, a light phase Parasitic Jaeger, passed by and hovered momentarily for a good view. Fork-tailed Storm-petrel were fairly easy to identify this time as they flew quite near the ship. On the northbound trip I failed to count them, as I saw only brief distant views and was not certain of their ID. The most exciting find of this leg of the trip happened while I sat watching directly forward over the bow. Two birds sat on the water hundreds of feet in front of the ship. As the ship neared them, I could see one was much larger than the other. I eventually ID’d the smaller bird as a Pink-footed Shearwater. The larger bird was to big for a Fulmar, but not big enough for an Albatross. I could not put an ID to the bird. As the ship got surprisingly close to the birds, the shearwater took off. Immediately thereafter, the larger bird did as well and I instantly had my ID. A large brown bird took off. It was big and bulky looking, and the instant I saw two large white wing patches in the fore wing, I knew it was a South Polar Skua!! I had seen two of these birds on a pelagic out of Westport, Washington, six years ago. The bird is so distinctive that any good look cinches the identification. I had never even considered that I could see that bird on this trip. I enjoyed seeing it so much that I forgot to grab the camera to get a picture. It flew off directly away from the boat, not to be seen again. I had always wondered if it was possible to have a productive birding experience on a cruise, and the answer is definitely yes. I think it is also important to realize that a birder can take a family-type vacation spending a great deal of time with their companions and get birds that they may only have dreamed of. I had a realistic possibility for eight lifers on this trip, though I knew a number of them would be difficult to find. I was successful in finding four of the birds. Though Alaska didn’t provide me with a huge state list, I was able to get a few birds that I would not have been able to get elsewhere. I can also say that I highly recommend Norwegian Cruise Lines for a Free-style Cruise. I had never liked the idea of having to dress up on vacation, nor of having to keep to someone else’s schedule. Norwegian provided us with an unforgettable experience without changing our own vacation style. One additional reason to choose Norwegian, from a birding perspective, is the rout it follows. Norwegian goes out into the open Pacific Ocean on both the north and south bound legs. Most other cruises take the inside passage east of Vancouver Island, where there are no pelagic birds. *life bird C- Canada A- Alaska W- Wash.
I’m sorry to let you know, but your sixth photo down entitled Margerie Glacier is in error. That is not Margerie Glacier. It is a receding glacier of unk. name a ways down the bay from the Margerie Glacier. We just cruised Glacier Bay last month (2017). Otherwise, your photos are beautiful and I enjoyed seeing them. Thank you again, Reid Glacier it is!